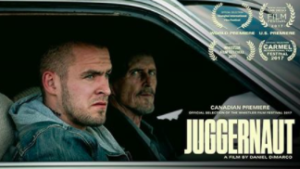 Juggernaut, Mad Samurai’s Latest production, and a Daniel DiMarco Film, is having its Canadian Premier at the Whistler Film Festival on Friday Dec 1st. The first screening will be Friday, Dec. 1st at 8:30pm with a second screening on the Sunday. Producer Mathew Cervi developed the script over 3 years and together with a stellar team put together and produced, what is sure to be a thought provoking film. Juggernaut stars Jack Kesy (Baywatch), Amanda Crew (Silicon Valley), Peter McRobbie (The Visit), and David Cubitt (Medium) in partnership with Canadian distributor Level Film. The production employed over 50 people including cast and crew and over 30 people with post production services. Keeping the film BC based, the majority of the filming took place in Kamloops, Ashcroft, Spence Bridge, Savona and Merit regions, with post production in Vancouver. Juggernaut received a portion of the Creative BC Slate Development fund which is provided to BC-based film or television entertainment companies with an envelope of money to support the development of two or more eligible film, television or web series projects. Matthew continues to develop engaging genre fare for the feature film and television landscape. His next big project is a horror film due out in 2019- Stay tuned.